Thanks to advocacy and awareness-raising from multiple quarters, more and more women are getting STEM degrees (Science, Technology, Engineering, Mathematics) overall. However, the percentage of women working specifically in Computer Science has gone down from 37 percent in the 1980s to 18 percent today. That's a big problem made more urgent when you consider how computer and mobile device driven all of our lives are–everywhere in the world. Reversing this trend and getting more girls and women into computer science is imperative. So Google, in conjunction with Chelsea Clinton (The Clinton Foundation), Girls Inc., Girl Scouts of the USA, Mindy Kaling, MIT Media Lab, National Center for Women & Information Technology (NCWIT), Seventeen and TechCrunch, just launched Made With Code, an initiative designed to help girls learn to code and inspire them to make coding part of their formal education and careers. The project launched yesterday with an event in New York City featuring several inspiring speakers and performances, plus some hands-on demos for the 150 girls in attendance. 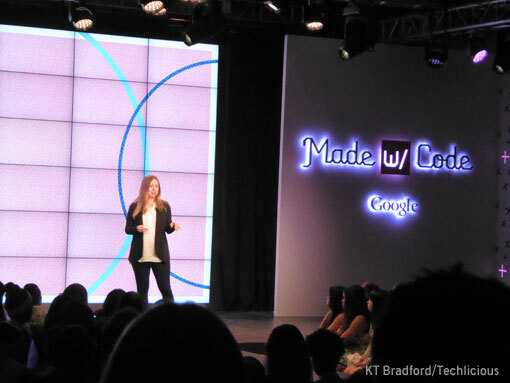 Made With Code's approach is based on Google's own research into the best ways to encourage girls' participation in computer science. Academic exposure is just part. It's also important for girls to get encouragement from family and peers, to understand that a love of puzzles and problem solving easily translates to computer science skills, and to know that a computer science degree won't limit them to only technical jobs. That last point was emphasized over and over by the speakers and the demos at the event. Danielle Feinberg, Director of Photography for Lighting at Pixar, spoke about how her job was as much about art as coding. Miral Kotb, CEO of iLuminate, uses code to create innovative dance performances by integrating tech, clothing, and multi-level choreography. 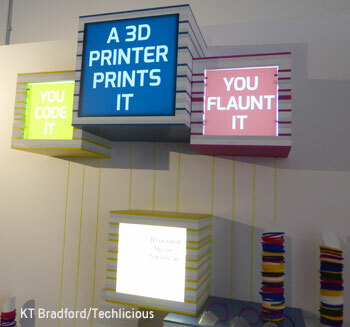 The demo area was filled with examples of code, ranging from making 3D-printed bracelets to clothes and tech-infused accessories to games and computer animation. While there was an emphasis on interests that can be classified as "girl stuff," such as fashion, this never came off as patronizing. The girls got the message that code is an integral part of the arts as well as business and architecture and any other career they may want to pursue. And they got the message that whatever inspired them or whatever they were passionate about was valid. This message likely served as a re-enforcement for the girls at the event, members of Girl Scouts, Girls Inc., Girls Who Code, and Black Girls Code. For girls across the country who may not have this foundation, the Made With Code website will serve as a resource for parents, teachers, mentors, and anyone who wants to help the young women in their life succeed through learning to code. The girls at last night's event got a nice surprise as the walked out the door: a goodie bag with a Nexus 7 tablet and a Chromebook. Though both of these devices are relatively simple by today's computing standards, they're plenty powerful enough to get started with coding. They can make a simple app with an Android tablet in less than a day. And with web apps accessible through Google Chrome they can get started creating websites, designing 3D printable objects, and working out circuit designs for flashing LEDs right away. Go to MadeWithCode.com to learn more about how to get a girl in your life interested and involved in computer science and how they can use those skills to pursue whatever their passions are.